A brief history of Hunter Pence's misadventures at Coors Field this year - Denverite, the Denver site! The veteran outfielder has struggled so much in the Rockies’ home ballpark this season he declared himself “a little snakebitten” after the game. Jun. 17, 2017, 1:04 p.m. The baseball looked easy enough to handle. In the bottom of the seventh inning Friday night, Raimel Tapia roped a breaking ball to right. It sailed over Joe Panik’s outstretched glove at second but looked like it could be corralled by Giants right fielder Hunter Pence on two hops. Pence ran to his right and appeared to be in position to cut the ball off. But as he tried to snag it, the ball caromed off his glove and bounced behind him. The error allowed Carlos Gonzalez to score from first and Tapia to reach third in the Rockies’ eventual 10-8 win. 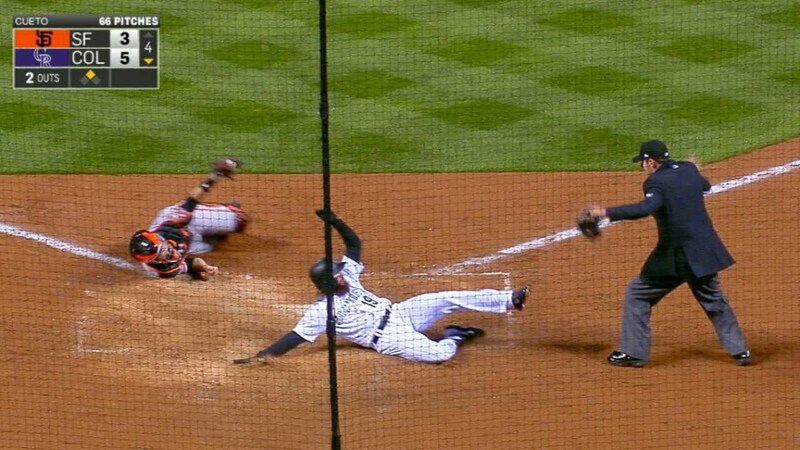 The play was one of several mistakes Pence has made in right at Coors Field this year. The veteran outfielder has struggled so much in the Rockies’ home ballpark this season he declared himself “a little snakebitten” after the game. Earlier in the game, Pence let a routine-looking D.J. LeMahieu fly ball sail over his head that let a run score. On Thursday, he misplayed a Charlie Blackmon hit off the scoreboard, which allowed the Rockies’ scruffy faced center fielder to reach third. Pence’s most egregious gaffe at Coors Field came in April. In the fourth inning of a game in which San Francisco trailed by two, Pence tried to wrangle a Blackmon liner. He was in position to grab it, but he slipped backwards — almost as if he’d run over a wet spot. Pence went down so hard he lost his hat. Blackmon took advantage of the mistake and scored an inside-the-park home run. The Coors Field outfield is among the most spacious in baseball. The fence in right is closer to home plate than the fence is in left. But dealing with baseballs that reach the real estate out there is still no easy task. Pence, who’s only been charged with one error this season, was asked about his misadventures at Coors Field after Friday’s game. Interestingly enough, Pence said one of the ways he could improve out there is by exerting less effort.